“St Patrick's Cathedral, Cashel, Co Tipperary, interior, choir, north elevation - seen from crossing,” Gothic Past, accessed April 20, 2019, http://gothicpast.com/items/show/1279. Photograph by Roger Stalley. 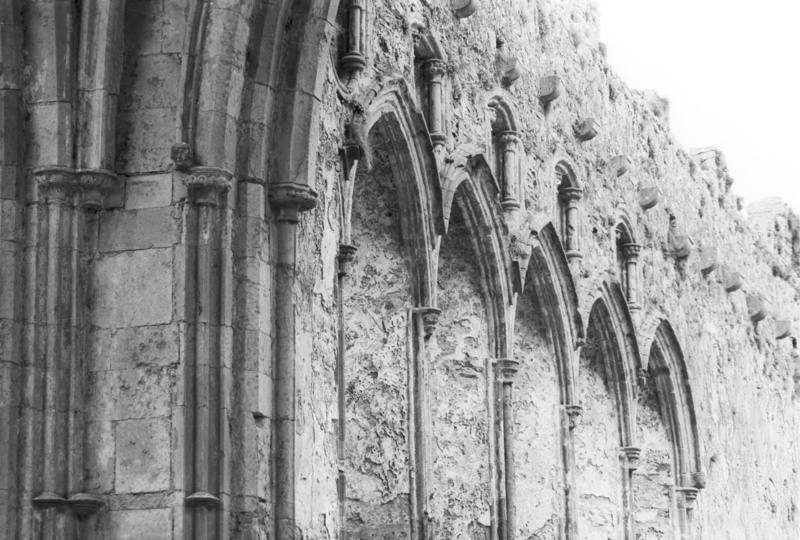 View of north elevation of choir from the crossing showing rere - arches of qutrefoil windows with foliate capitals filling the spandrels between five hood moulded lancet windows also with foliate capitals and rere - arches treated with roll - and - fillets. The north - east crossing pier is compound and annulets are placed on alternate shafts, foliate and head capitals support filleted and chamfered ribs rising to the vaults.